Call me shallow, but more often than not as I face these old photographs, I disregard the latent lessons of physiognomy and focus instead on the plainly visible systems of fashion. As I behold the ancient folks in my family forest, I’m readily fascinated by those fabulous threads, and nothing mesmerizes me like the hats and veils, assertively solid or sublimely gaseous, both proper and playful, that crown their heads. The lady seen here is Marie Bernadac, the second wife of Ernest Vidaud du Dognon de Pomerait, whose figure I sought to dissect in the previous entry. What can I say about Marie? Digital records are vague. She was born before 1850 and died after 1913, but that’s all I’ve been able to find. Yet it’s easy to surmise in her a picture of nineteenth-century provincial normalcy — or so her life appears to me right here and now on this rainy Friday afternoon in Los Angeles, as I quickly type these words riding north on the Pasadena freeway in the speedy strangeness of an Uber car… My hatless self looks at Marie Bernadac, and her shy smile is an overture to her inner life. Maybe she had not been photographed many times before; maybe she was less than proud of her less than perfect teeth; maybe she was a passionate reader who disliked being distracted from her novels and books of poetry… But her hat — I have no words for that operatic meringue, her own private, prêt-à-porter Matterhorn. As strange as this may sound, Marie Bernadac, if I had been a woman in a previous life, I wish I could have worn a crown as formidable as yours. In Vidaud posterity, Marie, you will now forever be known as the Lady with the Hat, and that, believe me, is far more real than the oblivion in which most members of your tribe now dwell. But how I wish photographs were emblems of transparent minds, icons that spoke actual words, watersheds of real stories and literal sentiments. An amateur genealogist in Barcelona not long ago read my blog and kindly emailed me three pictures of children. 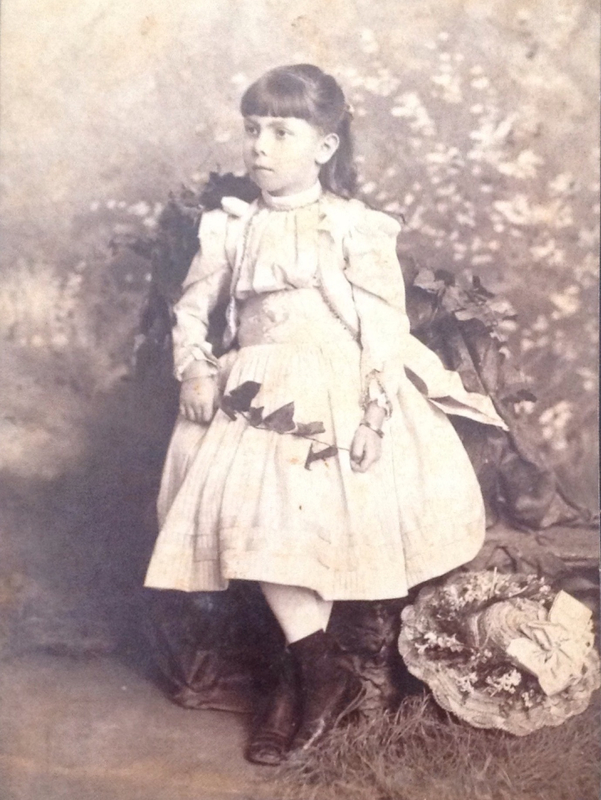 The girl seen here is Juana Amelia Vidaud Caignet, my correspondent’s grandmother, born in Guantánamo in 1851. She is also the sister of Alberto Vidaud Caignet, my grandmother’s grandfather, who was born, it seems, in 1848. Like their sister, María Vidaud Caignet, whose son at one point headed the Futbol Club Barcelona, Juana Amelia ended up spending much of her life in Spain. As I recounted earlier, she married Rafael Calbetó y Sambeat, who was Comandante del Presidio de la Habana in the 1890s. A married couple with a young son, they went to live in Catalonia; he, after all, had been born in Viella, in the province of Girona. But here Juana Amelia is just a child, posing with a blooming and wavy hat poetically displayed by her well-shod feet. I don’t know exactly when the picture was taken, but I suppose it must have been sometime before 1860. To be honest, as a childless person myself, I’m rather clueless about the age of children, or about what may be transpiring in their little minds. But I have the impression that Juana Amelia, despite her serious demeanor here, is a timidly happy creature inhabiting her own innocent wonderland. I wonder how much she knew about the slaves that she surely grew up surrounded by — those other, far less fortunate, lives on the island of Cuba. Perhaps she had her own servant who accompanied the family to the photographer’s studio, and then, after all the posing and clicking was done, picked up the florid hat from the floor, and then, many years later, finally no longer a slave, died an unrecorded death. And here we have her again, little Amelia (as it appears she was known) in a feathered hat with an anonymous child — “un niño desconocido,” as my correspondent puts it. 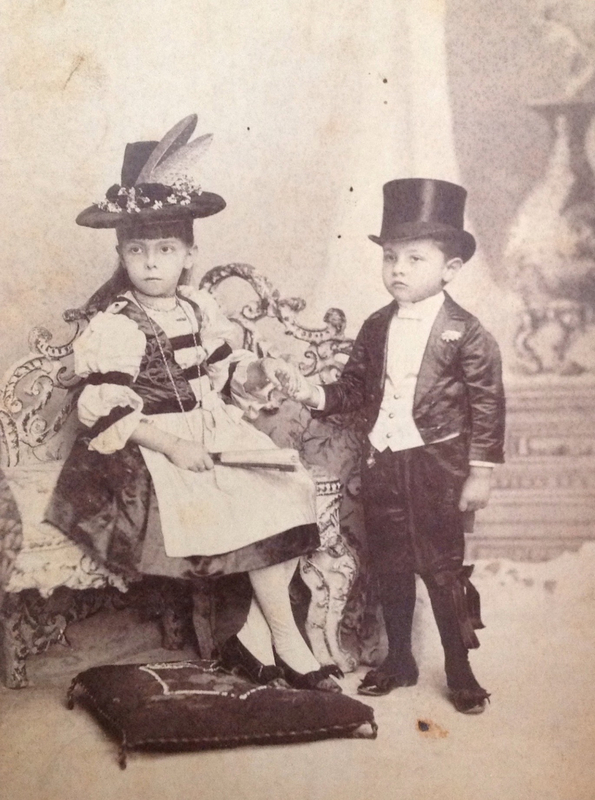 It is not farfetched at all — in fact, it makes sense — to assume that the little boy in the top hat is one of her brothers, either Alberto Vidaud Caignet, my second great-grandfather, or, more probably, Severo Vidaud Caignet, born in 1849, the only other boy among the seven siblings. Severo is arguably the most interesting character in our family tree, and I hope to return to him (and his direct descendants) again, but suffice it to say for now that he’s a bit of a legend, a gentleman who traveled to Europe many times, a bon vivant who appears to have shocked — at least a little — his more conventional relatives in Cuba, France and Spain. He appears as a bachelor in the faire-part announcing the death of his aunt in Auch: “Monsieur Sévère Vidaud du Dognon de Pomerait,” plain and simple, without a wife or children. (His older brother appears as “Monsieur et Madame Albert Vidaud du Dognon de Pomerait et leurs enfants,” a paterfamilias, while Amelia, by then a widow, is “Madame veuve Calbetó, née Vidaud du Dognon de Pomerait, et ses enfants.”) Years ago, when I taught French at a prep school in New Hampshire, a colleague and I took a group of students to France and we spent a week in Dinard, on the northern coast of Brittany. When I told my grandmother — she was in her late eighties then — about this part of our itinerary, she mentioned that one of her great-uncles (or was it an uncle, or a cousin?) used to summer there. I like to imagine that man was her tío Severo, and I like to imagine too that this little boy is Severo, or Sévère, himself, posing already with an finely crafted product of elegant millinery, one of the many hats he must have worn during his life. But what do I know? Most sources indicate that both Alberto and Severo were older than their five sisters, and this boy looks younger to me than the girl whose hand he is delicately holding. Maybe the accepted chronology needs to be revised in light of these hats? Or maybe a boy at that age looks smaller than a sister born two years later, since girls are said to grow up faster? And then there is this. The Vidauds and the Caignets were French, after all, so I suppose there must have been some Orientalist blood in their bluish veins. 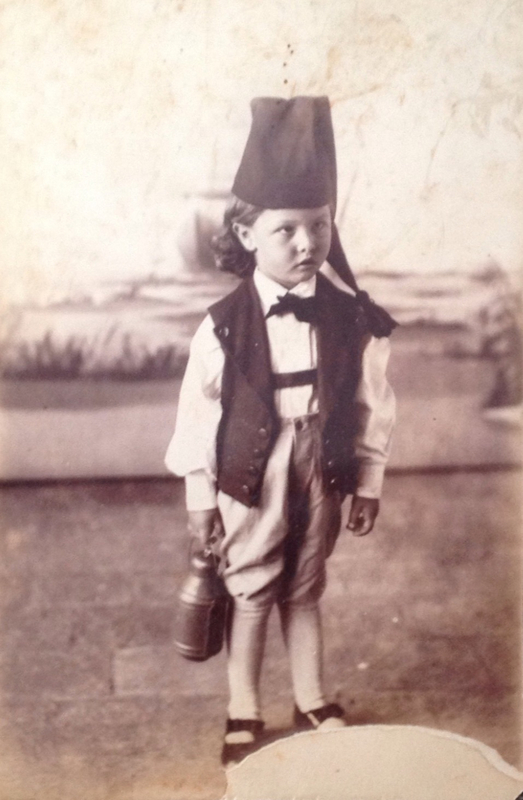 This vaguely Ottoman hat, if that’s indeed what it is, must have been the playful sartorial expression of some Eastern dream, placed on a boy’s head as he held some kind of magic flask in his hand. Perhaps we can imagine this is the older brother, Alberto, but most likely this is also Severo, sporting longer and wavier hair. Perhaps we can imagine how that exotic object awakened in the boy what appears to be his passion for luxury and voluptuousness, if not calm. In her wonderful notebook, María Magdalena Gonzales-Rodiles Vidaud, known as Nunú, reminisces about her uncle Severo, corroborating some of what others have alluded to. He traveled to France almost yearly, she says, and loved horse races, spending much time (much money?) at the Hippodrome de Longchamp in Paris. But the prodigal uncle always returned. Nunú writes about yet another sibling, a younger child, her aunt, Magdalena Vidaud Caignet, who was partially disabled from having contracted what must have been polio as a child. After her mother’s death in 1893, Magdalena went to live with her sister Matilde, Nunú’s mother, and took charge of her nieces’ education. In this, Severo played a beneficent role. From his trips, he would bring his sister what Nunú describes as “buenos libros” and “buena música.” He also paid for her subscription to the Musée des familles, the illustrated journal published in Paris until 1900, in which, in Nunú’s words, they could read “buenos artículos” about science, literature, and the arts. “Estudiamos también botánica,” Nunú adds, and this is a fact I’d love to know more about, given this blog’s origin in the realm of botany. Did they go out into the fields and forests of Oriente (if not the actual so-called Orient), collecting specimens like E.L. Ekman did, and if so, did they wear hats like the Swedish botanist must have? There’s no evidence of this anywhere to be found, but one can always imagine. 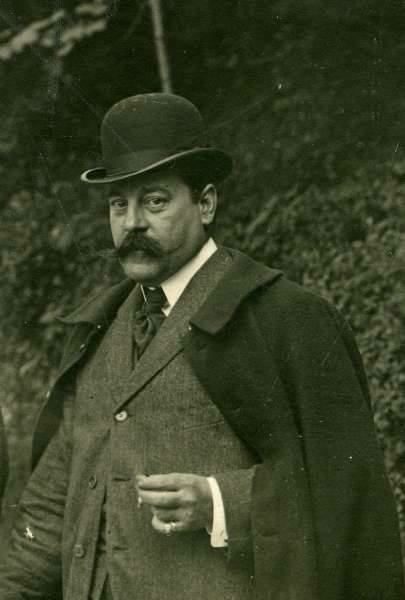 In Cuba or, more probably, France, Severo must have met the good doctor, the handsome scientist, Ernest V. du D. de P., the husband of Marie Bernadac, the Lady with the Hat. All that was far away and long ago. Writing this as I travel on the subway from Hollywood to downtown L.A., I wish I could reconstruct a half-truthful dialogue between both men, who were surely wearing hats when they first met. Or maybe not, as Severo would have visited Ernest in Pau or Paris, and the older man would not have been wearing a hat at home, and his maid would have taken the Cuban visitor’s hat when she greeted him at the door. I also wish I could find out what Ernest told Marie the first time she saw her in that voluptuous hat of hers. (I wish too, I confess, I could pry a little into their bedroom.) Here is a picture of Ernest, taken it seems sometime in the early twentieth century. Everything seems to indicate that this image is part of the same photograph of Marie Bernadac, but someone must have decided that husband and wife needed to be rendered separately on the web. Ernest is portlier than in his previous picture; wearing his bowler, he looks a little like Hercule Poirot, that other semifictional character. It was the Belle Époque, and the Great War would soon break, and Ernest, I regret to say, would soon be dead. What happened to this hat? What happened to Marie’s? Whatever happened to hats? I’ve read they went out of fashion with the mid-century rise of the automobile. My train is speeding beneath Los Angeles and, looking up from the iPhone on which I’m writing this, I see a couple of people — an absent-minded man and a surly young woman — wearing baseball caps. From time to time I too wear a baseball cap, and I wear other kinds of hats, mostly made of straw, but none as interesting as those objects my spectral relatives once placed on their heads. My station is next. I will soon be exiting into a mostly hatless world. Posted on February 7, 2015 February 16, 2015 by robertissimus	This entry was posted in Cuba, Fashion, France and tagged Alberto Vidaud Caignet, Dinard, Erik Leonard Ekman, Ernest Vidaud du Dognon de Pomerait, Futbol Club Barcelona, Guántanamo, Juana Amelia Vidaud Caignet, Magdalena Vidaud Caignet, María Magdalena Gonzales-Rodiles Vidaud, María Vidaud Caignet, Marie Bernadac, Rafael Calbetó y Sambeat, Severo Vidaud Caignet. Bookmark the permalink. Ya al final, bel Robissimus, “[…] Whatever happened to hats….” termina con un “?” en vez de con una “coma”, único gazapo involuntario que vi en este capítulo de tu espléndida saga in progress de los Vidaud; de la Marie que te sacas del sombrero; de ton oncle Severo, injusto nombre de pila donde los haya. No sé, Robilín, si lo estarás considerando, pero siendo evidente -al menos a mis pobres ojos- que tienes entre tus delicadas manos cartilaginosas una peculiarísima mezcla de crónica de viaje y épica familiar “caribeña”, BY FAR mucho más y más mucho que aquella más bien picúa de los Buendía, lástima sería que la íntima inteligencia -valga la redundancia- de un fresco tan-pero-tan delicioso, no lo… trashumaras, ¿cómo decirte?, en una fuga novelística. A te la parola, mon dearest frère. Perdona el atrevimiento, pero amanecí con 39 de fiebre, tercera recaída en una INFLUENZA que me ha impedido terminar mi Rehabiltación post-operatoria de 12 sesiones (aún me quedan 4): mañana lunes 9 me harán un análisis de sangre… incluyendo cultivos virulentos y bacteriolentos, a ver. Gregorio, usted dice siempre cosas tan interesantes y ciertas. Si supiera que esta entrada me enfrentó con el viejo dilema de la historia contra la ficción. Hay un episodio de naufragio cerca de la costa de naufragio y heroísmo que era el desenlace perfecto para la vida de Severo. (Sí, nombre pesado, excepto que con el tiempo regresa a Francia y se convierte en la Séverine de “Belle de jour”.) Pues, en la primera versión de la entrada, el cuarto párrafo terminaba con Severo en el agua, tratando de salvar a otro que no sabía nadar, ahogados los dos, algún sombrero imaginario flotando cerca de unas rocas… Todo esto era así hasta que releí el cuaderno de Nunú y descubrí que el héroe ahogado no era Severo, sino otro hombre, otro antepasado que hasta donde sé no merecía esa muerte romántica. Entonces me dije, qué pena que el maldito blog no alcance aún su verdadera forma, la de la novela. Lo imagino a usted en la cama, sufriente como nuestro Dahlmann, y sueño con otro día mejor, que sé a ciencia cierta llegará pronto. Besos y abrazos, para usted y para la princesa.